Six months after launching their integrated PressPage newsroom, news readership quadrupled compared to the stats of the native newsroom. The center's Facebook page grew by 16 percent, with a 52 percent increase in reach. When you represent a hospital specializing in brain and spinal cord injuries, it's not every day you have the opportunity to make the evening news. That's why the Atlanta-based Shepherd Center has used a content strategy based in rich storytelling from its newsroom to catch the attention of new media outlets. The newsroom is the center of the hospital's storytelling through articles, photos and videos. The strategy is amplified through social media and paid promotion via the content amplification platform Outbrain, says Jane M. Sanders, the hospital's associate director of public relations. Perhaps it's natural that a hospital filled with heart-wrenching and inspiring stories would take a brand journalism approach. Shepherd Center has offered a feature story about a former army medic healing from traumatic brain injury, tips for raising a child when you have a spinal cord injury, and a tale about celebrating Thanksgiving with a family member who is newly able to get about with a walker after damaging her back in a fall. The newsroom is run on PressPage software, which enables easy posting and social media sharing. The newsroom has had nearly 186,000 unique visits in this calendar year, a huge spike in traffic over last year, when it adopted the software. "I just had one today from the local Fox affiliate," Sanders says. "This is the time of year when reporters are looking for copy to fill some holes for the holidays, when they have people out or they have a lot of air time to fill. So, we were able to give him two stories we published from our newsroom in the last couple months. It looks like they're going to do both of them." One of those stories dealt with a basketball coach returning to work after rehabilitation for a diving-related spinal cord injury. The story used him as a peg to discuss Shepherd Center's diving injury prevention campaign. The piece quoted an expert who said, "The simple message is always to go feet first. Diving is never worth the risk." Another story discussed how activity-based therapy, a neurological rehabilitation program, promotes functional improvement and lifelong wellness. It led with a description of the gym that houses Shepherd Center's Beyond Therapy. From the beginning, PressPage provided an easy-to-use platform that allowed us to migrate existing content to the newsroom and launch the new site within a short timeframe. The steps leading to launch were guided and well organized by PressPage. "We get great engagement, especially when we include a video in a newsroom story," Sanders says. "Videos really drive people's interest, especially when we keep them short—under two minutes." One recent video helped promote the hospital's mission of advocacy and community accessibility for people who use wheelchairs and other methods of navigation around the community. Shepherd Center posted a black-and-white video and music from 1928 to create a humorous newsreel to address etiquette when you encounter a wheelchair user in a doorway, whether it's interior, exterior or getting on and off an elevator. "What we try to teach patients is that we want them to be as independent as possible," Sanders says. "If they're able to open a door for themselves, then we want them to be able to do that, and not have to depend on someone to be with them all the time." 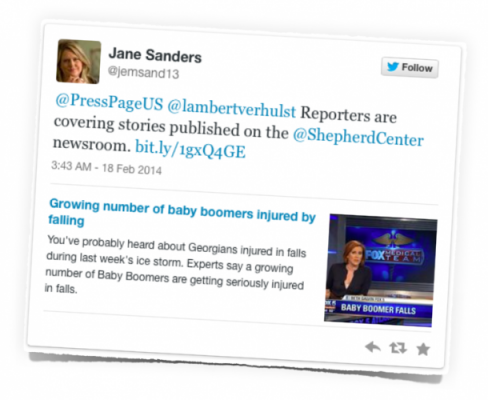 Shepherd Center is amplifying content through Outbrain. The company places a photo and a link at the bottom of popular websites, driving traffic back to Shepherd Center through the hospital's own stories. "Say you search for 'wheelchair,' and then you see down at the bottom, 'From around the Web,'" Sanders says. "You'll see a thumbnail and a short headline under it. That's typically promoted content that is either through Taboola or Outbrain." "The more I've worked in it," Sanders says, "the more I see that it does have multiple purposes to it." This article is written by Russell Working and was orininally published on PR Daily on December 22, 2015.